PanARMENIAN.Net - Prime Minister Nikol Pashinyan on Tuesday, April 2 met the chairman of the State Revenue Committee, David Ananyan. In a Facebook post published immediately after the meeting, Pashinyan revealed that the budget collection plan for Q1 was overdone by AMD 11.4 billion. According to him, Armenia’s reserve fund totals AMD 9.4 billion, which means that budget overperformance in the first three months of 2019 exceeded the reserve fund by AMD 2 billion. 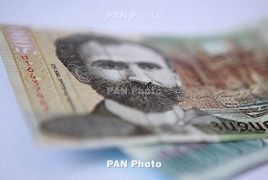 In March 2019, 8․361 million more fiscal receipts were printed against the same period last year, and 20․71 million more receipts were issued in Q1, Pashinyan added. Gegard Mousasi, a mixed martial artist of Armenian origin, will defend his middleweight title against American Rafael Lovato Jr. The World Bank Group Board of Executive Directors endorsed the 2019-23 Country Partnership Framework for Armenia. The International Monetary Fund expects Armenia's economic growth to slow to 4.5% this year from 5.2% in 2018. Tatevik Revazian said she has held talks with senior executives of the Irish carrier in Dublin for that purpose.